Place the leaves in the boiling water and blanch for 3 minutes. Remove, rinse under cold water, and drain. Set aside. Slice each carrot in half, lengthwise. Slice each length into long thin strips about 1/4 inch thick. Place in the carrot strips in the boiling water and blanch for 2 minutes. Remove, rinse under cold water and set aside. Place the spinach in the boiling water, pushing down under the water with a slotted spoon to evenly cook. Cook 1 1/2 to 2 minutes. Remove, rinse under cold water and drain. Take an Eden Sushi Mat and place it on a cutting board. Place three cabbage leaves next to each other on the mat so that they overlap each other with the thick part of the leaves closest to the bottom of the mat. Take 1/4 of the spinach and spread it on top of the leaves. Place 2 carrot strips across the width of the leaves. Roll up in a jelly roll fashion, being careful not to roll the mat up inside the leaves. Wrap the mat completely around the roll and gently squeeze to remove excess water from the vegetables and to shape the roll. Remove the mat. You should now have a log-shaped roll. Slice into 1 1/2 inch rounds and place on a serving plate with the cut surface facing up. Repeat the above steps until all ingredient have been used. When done, place a small dap of umeboshi past on top of each roll. Eat like sushi. 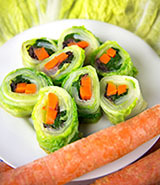 As a variation, any Eden Gomasio, Eden Shake, Eden Dulse Flakes or Eden Shiso Sprinkle can be sprinkled on the vegetables before rolling and cutting.